(Reuters) - The White House said on Monday that most unaccompanied minors flooding into the United States from Central America will not be allowed to stay as the Obama administration prepares to ask Congress for $2 billion to address the border crisis. White House spokesman Josh Earnest said most of the border-crossers would not qualify to stay in the United States. Those who possibly could get asylum are children who have been victims of domestic abuse. Minors who fled because of gang-related violence could have a harder time qualifying, according to immigration experts. The strong warning came as the White House is expected to lay out on Tuesday what it wants in emergency funding from the U.S. Congress to deal with the flood of children. The money would go toward more detention facilities to house the children and additional immigration judges and asylum officials to expedite hearings. A Justice Department official told Reuters the aim is to hire 30 more immigration judges to help tackle the case load. The spending bill could face some rough going in Congress, however. Senator Richard Shelby of Alabama, the senior Republican on the Senate Appropriations Committee, told reporters any measure should be paid for with cuts to other government programs. "Absolutely it ought to be offset," Shelby said, adding that money could be taken from Obama's landmark healthcare law, a move that likely would be opposed by the White House and congressional Democrats. More than 52,000 unaccompanied minors from Guatemala, El Salvador and Honduras have been caught trying to sneak over the U.S.-Mexico border since October, double the number from the same period the year before. Thousands more have been apprehended with parents or other adults. Many are fleeing extreme poverty, gangs and drug violence, as well as responding to rumors spread by smugglers that children who reach the U.S. border will be allowed to stay. Ana Garcia, the wife of Honduran President Juan Hernandez, on Monday said that U.S. officials had told her that they would begin sending flights of deported families back to Central America next Monday. The U.S. administration also plans to ask Congress to alter a 2008 law on human trafficking to speed up deportations. 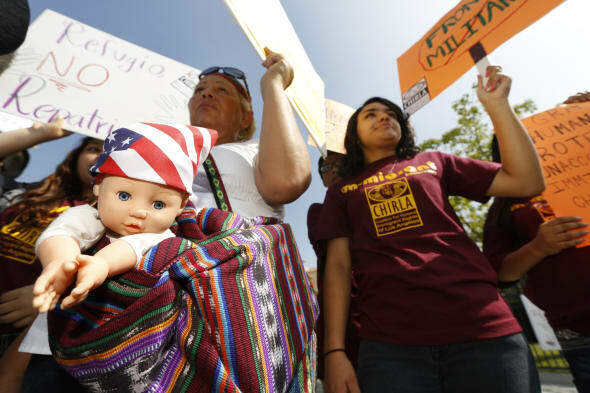 Some of President Barack Obama's Latino allies oppose this because they see the children as victims. Obama is due to visit Texas this week to raise money for Democratic candidates running in November congressional elections, but the White House said he would not visit the border, a sign that officials do not see a political upside. While White House officials anticipate some Republican criticism over the request, one senior House Republican aide, who asked not to be identified, said the measure could attract less opposition than some previous appeals. "There is a feeling that it's clear more resources are needed" to deal with as many as 150,000 unaccompanied minors, who could arrive during the current fiscal year, the aide said. A senior Senate Republican aide, however, said party support for an emergency spending bill would not be known until senators see details. The House and Senate can alter Obama's request before sending him any legislation to be signed into law.